India too has contributed its own share to conserving coral reefs and marine landscapes by setting up MPAs in different geographic locations. Based on their design and conservation priority, MPAs can either be no-take zones, where fishing and other extraction is completely prohibited or can be allowed partially. So far, 31 MPAs including 4 Marine National Parks have been established. Gulf of Kutch was the first Marine National Park that was established in 1982. Following which, Mahatma Gandhi Marine National Park (MGMNP) was established in Wandoor, South Andaman in 1983; Gulf of Mannar Marine National Park and Rani Jhansi Marine National Park were established in Gulf of Mannar and South Andaman respectively. There are 15 islands falling under MGMNP, covering an area of 281.5 sq. km. Of the 15 islands, only 2 islands, Red Skin and Jolly Buoy are open for tourists. While the forest department has been managing the park, and has been responsible for conserving the coral reefs for over 2 decades, it is also important to identify the other stakeholders of the park like the fisher community dependent on the coral reef fishes and the tour and boat operators, who benefit from the park. In a recent report submitted to Andaman Nicobar Environmental Team and Dakshin foundation, Madhuri Mondal of Tata Institute of Social Sciences recorded the perception of the locals towards the park. Titled ‘Factors influencing the perception of the communities towards Mahatma Gandhi National Park’, the study also identifies the direct and indirect dependence of the community, on the park, for livelihood. The survey was conducted along the villages bordering the national park, which includes Wandoor, Guptapara, Manjery, Indira Nagar and Rutland. Through the study, Madhuri came across various perceptions with regarding MGMNP. Resource dependence is the most important factor which influences the perception of the community towards the park. There was a huge contrast in the views of respondents who were directly benefiting from the park and the respondents whose livelihoods got impacted due to the creation of the park. The study states that people from the community at Wandoor are more directly dependant on the park for their livelihood than the other villages bordering it. Direct dependants like tourist boats, souvenir shops and hotels near the park, which cater to the tourists have a positive perception of the park. It also includes Daily Rate Mazdoors, who are employed in jobs like monitoring the turtle nests during the nesting season, mangrove plantations and patrolling. People who depend on the park’s resources, but do not earn livelihood from it were categorized under indirect dependency. These respondents, who were either historically dependent on the park or dependent for navigation like the fishers, complained about the park. The communities living on the fringes of the park rely extensively on fishing for livelihood. 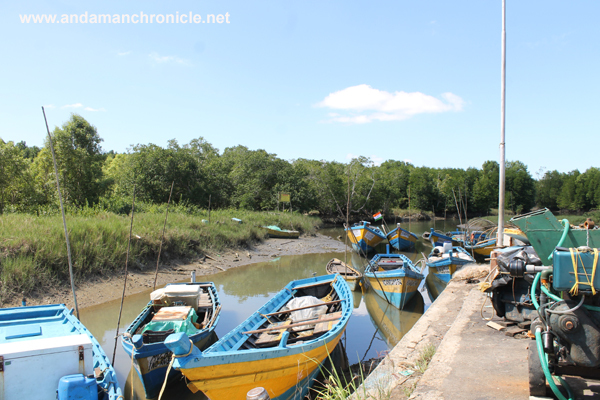 The export market dictates the fishing pattern in most of the villages around MGMNP. The fishers have had a long history of fishing and harvesting patterns ranging from shell and sea cucumber harvesting to fishing for groupers. Since the MGMNP is a no-take zone, fishers travel 4 to 6 hours a day to get to their fishing grounds. Unlike terrestrial Protected Areas, the boundaries of marine protected areas can be very ambiguous in nature. Many fishers mentioned about the friction with the management of the park, since the boundaries are not clearly demarcated. The forest department placed buoys to mark the boundaries of the park. But, few fishers from Guptapada and Manjery mentioned that there was confusion prevailing in the community about the boundaries of the park. During the study, few fishers also highlighted the improper construction of the New Wandoor jetty, which cannot be used during low tide. The findings of the study state that due to increasing restrictions, the fishermen cannot park their boats in the park in case of extreme cases like cyclone or breakdown of the engine. All these reasons have contributed to a perception that the local community is alienated from the park. The crocodile attack that took place at New Wandoor beach in December 2017, despite of safety nets being installed by the forest department further adds to the discontent among the community. Coral reefs are complex ecosystems that house several reef associated fish, which are very important to community’s livelihood and food security (Garcia and Rosenberg, 2010). Globally, 25 per cent of the marine fish catch comes from corals reefs (UNEP 2006). But the health of corals in Andaman Islands has been declining noticeably. “The main cause for reef degradation inside MGMNP is a series of natural catastrophes, including the infamous tsunami and bleaching events. In addition, the excess sedimentation has also affected the health of coral reefs inside the park, says Vardhan Patankar, a marine biologist working with Andaman Nicobar Environmental Team (ANET). To reduce this stress, it is important that the community living near the park is aware of the importance of the corals. “During the course of my study, I noticed that the people employed in tourism and the fishers who have been fishing for over a decade value corals more than others and they acknowledge that the corals are degrading. The others who do not depend on corals for their livelihood are indifferent to its degradation, Madhuri says. “The forest department is very active in the park and has been conducting awareness programmes about coral reefs and their importance for communities around the park. At the same time, they need to scale up their efforts in order to make the communities aware of the different species of corals” Vardhan adds. Since MGMNP has been set up with a top-down approach, where the decision making of the park does not involve the community, they feel alienated from the park. “Communities living around the park see it as a hurdle, as it restricts their resource use as well as their free movement to the sea. This impacts their livelihood. In order to meet the long term conservation objectives of MGMNP, the park authorities need to understand the issues faced by the communities and involve them in the management of the park. Only by including people and sharing benefits of conservation can we ensure the long term security of the corals and marine eco systems, Madhuri opines. The study also mentions the detailed Eco-Development Committee (EDC) plan created by scientists from Salim Ali Institute of Ornithology and Natural History (SACON) in 2013, which was submitted to the forest department. Few meetings were held for the creation of EDC in Loha Barrack Sanctuary, but they were not successful. The Eco Development Committee was formed on paper, but nothing has been done on ground to involve the community. To ensure the maximum benefits from the MPA, it is important that consultations are held with the communities and initiatives like sustainable fishing practices and alternate livelihood generation are taken into consideration.